DENVER, April 2, 2018 /PRNewswire/ -- DaVita Kidney Care, a division of DaVita Inc. (NYSE: DVA), a leading provider of kidney care services in the United States, today honors National Donate Life Month, a time dedicated to encouraging Americans to register as organ, eye and tissue donors and to recognize those donors who have impacted the lives of others. "Many of our dialysis patients are awaiting a life-changing kidney transplant, and we need more donors to decrease the wait time for eligible patients," said Bryan Becker, M.D., MMM, FACP, CPE, chief medical officer for DaVita Integrated Kidney Care. "We thank donors who have already made a difference and ask others to consider changing a life by becoming a living donor or agreeing to become a deceased donor when renewing a driver's license or through a state's donor registry." A kidney from a living donor offers patients eligible for a kidney transplant an alternative to dialysis and reduces the potential for adding to the waitlist. This benefits the entire kidney community. The median wait time for an individual's first kidney transplant is 3.6 years. 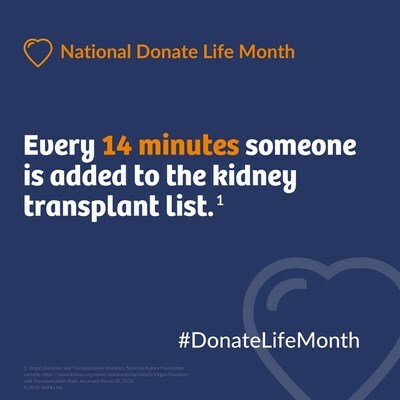 Every 14 minutes, someone is added to the kidney transplant list. Nearly 3,000 new patients are added to the kidney waiting list each month. While an overwhelming number of Americans support organ donation, the disparity between donors and candidates for donation continues. Accepting the responsibility to be a donor decreases that disparity. To donate a kidney, an individual must be 18 or older and be in good physical and mental health. Individuals who would like to learn more about donating a kidney and starting the registration process can visit the National Kidney Registry or the National Kidney Foundation. To learn more about kidney disease and kidney transplants, visit DaVita.com/Transplants. DaVita Kidney Care is a division of DaVita Inc., a Fortune 500® company, that through its operating divisions provides a variety of health care services to patient populations throughout the United States and abroad. A leading provider of dialysis services in the United States, DaVita Kidney Care treats patients with chronic kidney failure and end stage renal disease. DaVita Kidney Care strives to improve patients' quality of life by innovating clinical care, and by offering integrated treatment plans, personalized care teams and convenient health-management services. As of Dec. 31, 2017, DaVita Kidney Care operated or provided administrative services at 2,510 outpatient dialysis centers located in the United States serving approximately 198,000 patients. The company also operated 237 outpatient dialysis centers located in 11 countries outside the United States. DaVita Kidney Care supports numerous programs dedicated to creating positive, sustainable change in communities around the world. The company's leadership development initiatives and social responsibility efforts have been recognized by Fortune, Modern Healthcare, Newsweek and WorldBlu. For more information, please visit DaVita.com.